So it settled. The migraine. This is the end of day eleven, making this the longest migraine I've had since last July. Actually, one brief evening's flicker in November apart, it's the only migraine I've had since then. So no complaints. The change of medication I had in September has done a great job - and had one significantly positive side effect of which I will write more in the days to come. Before that point, in the first six months of the year I had three migraines - 8, 15 and 22 days in duration. What causes them? Too many things. Diet has some effect. As does stress. As does the weather. All these things can come together and not cause one. Or seemingly there can be no trigger, and one happens. Given the remarkable stresses of the job since last September, to get this far without so far succumbing is a major triumph. Again, credit to the new drugs, which I take religiously, twice daily. The length of an attack is the main problem. Fuzziness and forgetfulness and dizzyness and the like are all very amusing in short measure; they grow old quickly. As do the headaches themselves, though these vary in intensity, and darkened rooms etc help - as do simple pain killers (when in industrial strength - thanks, doc) though little else does. Coke can help - Coca Cola, that is; the caffeine sometimes seems to knock the edge off. But it also stops me sleeping. Swings and roundabouts. And at 27 days I shall be going on holiday. I hope to be sorted by then. But if stress is a major factor, a holiday will help. Though a migraine lasting 27 days will be a recent record, even by my standards. Still: perspective. It's a debilitating headache. That's all. God is good, and there are many, many people who would give anything to be so lucky. There was a posting below this, which I have removed, about the Pakistan/Ireland cricket match entitled "Such Games as These". Given all that has happened since, I felt I should remove it, and I should be so lucky as to be able to complain about a migraine. So I am driving up the hill to the spot where I always walk the dog. It's a single track road, pretty wild. And suddenly as I round a corner, there's a cyclist coming at me, really fast. I brake. He brakes. I come out of it better. I don't hit him. I stop well. I'm driving carefully, cos the road is tricky, and I do it every day. 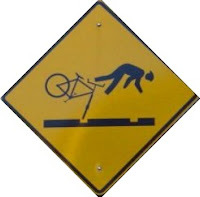 But he is coming downhill towards me and is going fast; he hits his front brake so hard that he goes over his front wheel, smacks onto the road, hits his head with a crack, hits his face, his arms, his legs. He's wearing a helmet, which I think saves his life. He lies there. I wait, I'm in shock. I call out - are you OK? He moans. I get out of the car. He is lying at the side of the road, his bike in the middle, about ten yards in front of me. Are you OK? Yes, he says, getting up. His left eye and chin have gravel grazes. His right trouser knee is torn. He is struggling to stand. Sit down, mate, I say. I'm OK, he replies. Then he keels over and hits the road face forwards, eyes going back into his head. I call an ambulance. I think I am fairly upset at this point. I mean - it's not my fault, it's an accident, and yet it is entirely my fault. If I had set out two minutes later, he'd have reached the wider bit of road. If he'd have been concentrating, he'd not have hit the brakes so hard. If I'd decided to feed the dog before setting out to drive up to out usual walking spot, we'd never have met. He'd be OK. It's an accident. Accidents do happen. He comes to, he calls his wife, his daughter answers. I'm feeling terrible. There is a world of people affected by something I'm a part of - but didn't do! The ambulance comes, eventually, but by then he is lucid again, OK, though the second fall gave him matching gravel grazes on the other side of his face. He says it's OK it's not my fault. I leave him with the paramedic. His name is Dave. He never asks mine, and in classic British style, I never offer it. I take it back. Well, not entirely. I mean, the vanity thing holds, all those famous Christians who have a MySpace notwithstanding. But I take it back, because I have discovered all sorts of things through this experience, which are proving really worthwhile. 1. We have a star in our youth group. Matt Truelove is a 16 year old lad in our youth group, and he has an amazing singing voice. I had no idea. But on his site he has some tracks of him singing some songs, and he is genuinely great. I want to encourage him to go for it, cos I am really impressed. 2. I discovered IM - instant messaging, and have had a couple of enjoyable keyboard conversations with Karen in Maryland via IM. Anyone else out there who does this - let me know! 3. I came across the MySpace of Charlie Groves, old friend of many years ago, and he called me, woke me up yesterday morning, and we had a great chat over the phone. As he now lives in Bristol, I hope we will meet up soon. Plus, I've had fun writing the site and messing with photos. So, a pleasant diversion! Try it! Last night I had a sudden migraine set in. Today I have lived in semi-darkness, and it is diminishing. This is only the second bout in six or seven months, the first lasting only an evening back in November, so the current medication is doing a good job. If this calms down quickly, I remain happy. If it settles in, it will be the first prolonged bout since last summer, and that is pretty good going, and still means that I've had the longest migraine-free period for about 3 years. So I am still giving the current medication good marks. We'll see. However, it remains a bit of a shock after so many months to get such a sharp attack. It's true. Click here and see for yourself. Last night Karen, the BBC producer, said I should get myself a MySpace site. So today I did. It feels like ultimate vanity. So make me feel better. All you fellow MySpacers out there sign up as my friends. Anyway, a fair few friends do have sites. And some of them are geunine holy people. And what is the difference between that and this? ...Except that this gets to actually say something, and to listen to your responses, other than just advertise ME. So I made my blurb appropriately self-deprecating in a double-bluff sort of a way. Done. At last. My computer tells me it's eleven twenty six as I start to type this on Monday evening. I've just come in, at the end of my working day. This evening we recorded two short morning services for BBC Radio Wales. The first will be broadcast on Easter Sunday at 8am, the second on June 17th (which happens to be Father's Day - but which has nothing to do with the subject matter of the service). Both can be accessed via the web for a week after they are broadcast on the BBC Wales site - I'll post a reminder for my faithful overseas listeners! I opened up the church at 4pm and closed it at 11.15pm. Seven hours. They started recording at 7.10pm and finished at 10.10pm, three hours. Record time I think for two broadcasts that will come in at around twenty four minutes each. Still, if I will involve a cast of fifteen readers and twelve musicians, and ask the moon from all participating, including children, then what can I expect? Though would you expect any less of me? And when you hear the broadcasts, please note this: in all those voices you will hear, mine is amongst them. But only amongst them. For we are starting to be a church here where all sorts of gifts and talents and people willing to use their gifts and talents are coming to the fore. And though these are things that take work and time - they aren't half exciting. So tonight was time to record; and now it is time to sleep. ...but sometimes it has a bit of fun. However, as I walked down the road this evening, the illusion of this shot was too good to pass up, and I though regular readers might enjoy it. 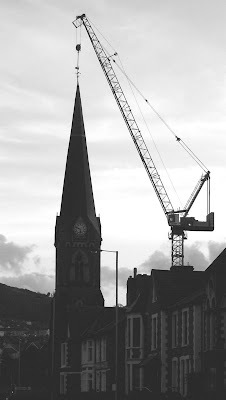 We were offered a significant sum of money to allow the crane to sail over our land, but the Church in Wales and I agreed that the sum offered came nowhere close to compensating us for any inconvenience we would suffer if any damage were to be done to our building. Insurance is one thing, but the hassle we'd have to put up with, and the the conservation issues raised meant that it was really a no go for us. And the whole town is finally realising that the building that will go up on that site will be really high, and that my words on the subject may not have been so exaggerated. Does that sound ever so slightly like "I told you so"? Forgive me - I think in the circumstances it isn't wholly terrible of me. Actually, I have got used to it now. Already I am wondering how it will be a blessing for us, and how we can be a blessing to it. A huge office block/car park, the promise of more shops - this means a lot more people right next to us. In evangelism terms, that's a real gift. So: no more Mr Nasty. No more Rev Grumpy. No more Letters to the Editor. I promised evidence of my evening with the Byron Jones Big Band. Here are a couple of blurry photos. When I've worked out how to do it, I'll add a link to YouTube for the strong of heart! And my right leg still hasn't quite recovered from a rather energetic kick in "Ain't That A Kick in the Head". I should know better at my age. What's funny is listening to the recording of the evening and then seeing the video footage - the songs that sound better are the ones that look dull. The ones that look better, sound pitchy. I guess I need to work on that old stagecraft thing. Hey, I had a great time, and you never know, one of these days I might get to poison the other singers again - I mean, they might not be able to make it again, and I might be asked back!